If you walk around either side of The Printing House, the well-loved West Village factory building dating from 1911 and overlooking James J. Walker Park, you will come to the gated entrance of a mews that runs parallel to Hudson Street, straight from one end of the building to the other. 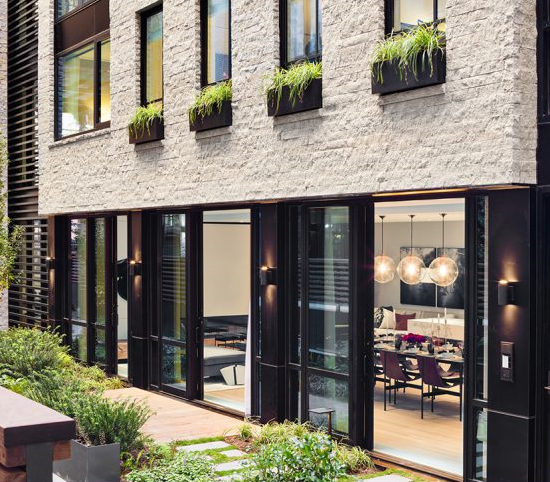 Maison Gerard was recently asked to furnish part of a townhouse located in these beautiful mews, (which have been freshly refurbished inside and out by Andrew Kotchen of Workshop APD and Gunn Landscape Architecture). 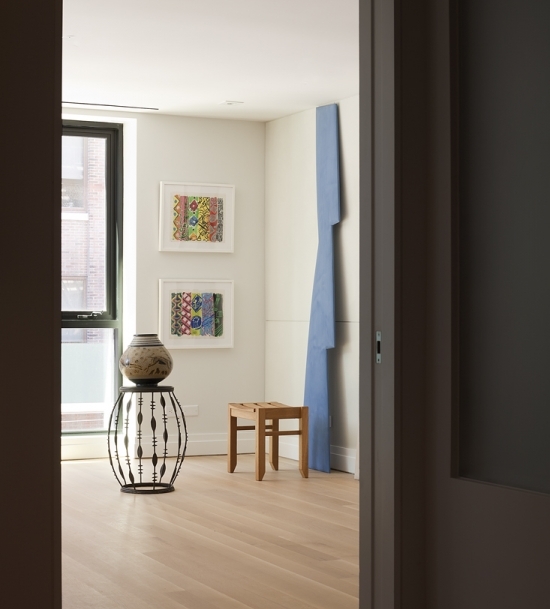 The gallery’s project was part of an exhibit, dubbed “Muse in the Mews,” that was curated by gallerist James Salomon of Salomon Contemporary. The show is the first in a series utilizing high end residential real estate as exhibition space for art. Salomon hung the walls with work from an array of incredible artists including Richard Pasquarelli, Dylan Egan, and Judith Hudson. 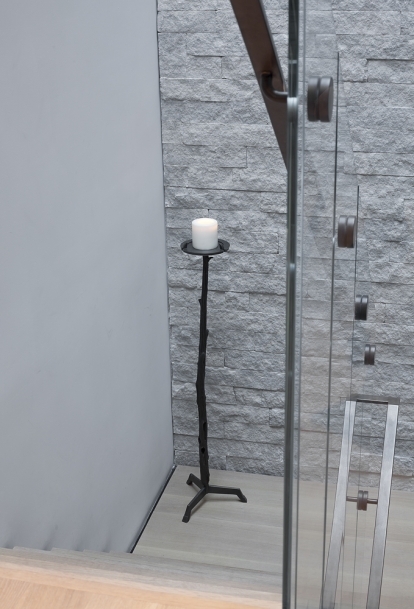 Maison Gerard focused on the top floor and roof terrace of the townhouse, creating an indoor-outdoor space as keenly attentive to comfort as aesthetics. 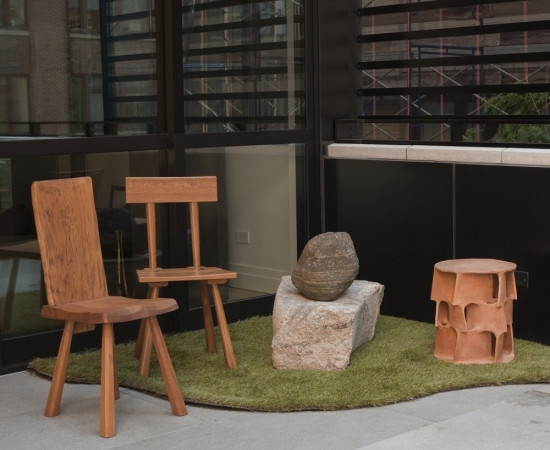 Amidst the warm glow of candles and soft presence of blooming plant-life, the gallery placed work ranging from art (ink drawings by Mark di Suvero and Yongjin Han) to classic décor (outdoor furniture by the likes of Knoll and Jean-Charles Moreux). There were even a few playful pieces, like a pair of colorful papier mâché crocodiles by the collective of contemporary Vietnamese artisans known as Atelier Saigon. 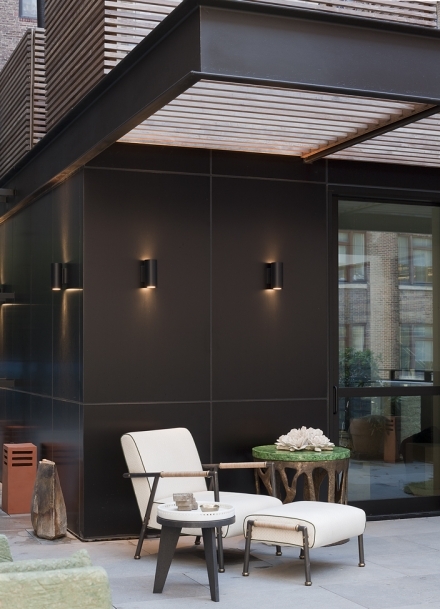 In short, the gallery turned the space into a welcoming escape, a plot of peaceful real estate a terrace above a mews should be. Photographer Robert Levin, for whom the gallery held a show in 2016, shot the space for us last week—here's what he found. A set of chairs by the Artisans of Marolles; a table by Boris Tabacoff; a set of Moroccan dishes; and a ceramic vase by Atelier Saigon. 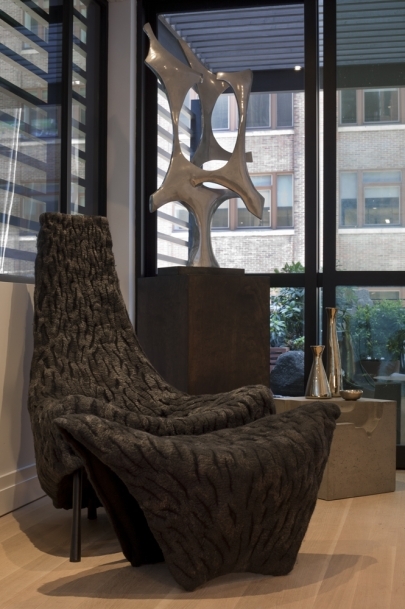 A chair and ottoman by Israeli artist Ayala Serfaty; a sculpture by Fred Brouard; a side table by the Toronto based firm Stacklab; and a few polished, sand cast bronze pieces by Jaimal Odedra. A patinated torchère by Salvatore La Rosa, on the corner landing leading up to the top floor. 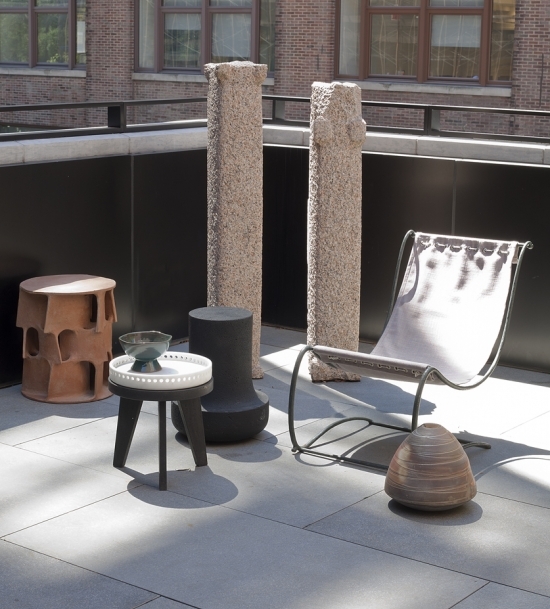 A pair of small side tables by Stéphane Parmentier; a patio chair by Jean-Charles Moreux; a pair of sculptures in stone by Yongjin Han; an illuminated, earthenware side table by Guy Bareff; and, on the ground, a small stoneware vase by Eric Astoul. 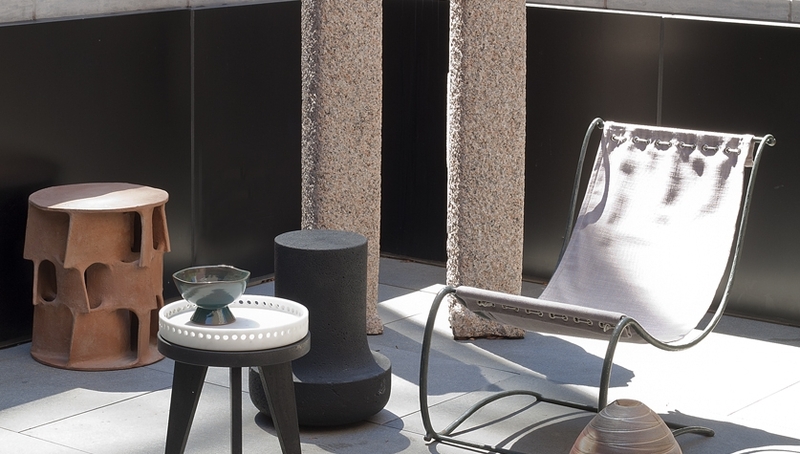 The M'Benga side table by contemporary French artist Franck Evennou; a glazed ceramic Primavera vase; and a small stool by Guillerme et Chambron. Two paintings by Kim Macconnel (from James Salomon Contemporary). 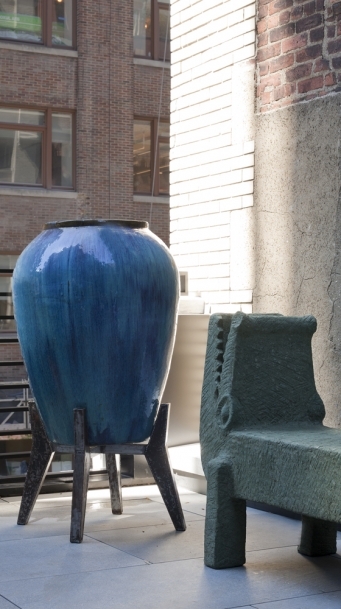 A monumental, glazed ceramic urn with a patinated steel base, and a crodile bench of papier mâché. Both by Atelier Saigon, of Vietnam, circa 2010. 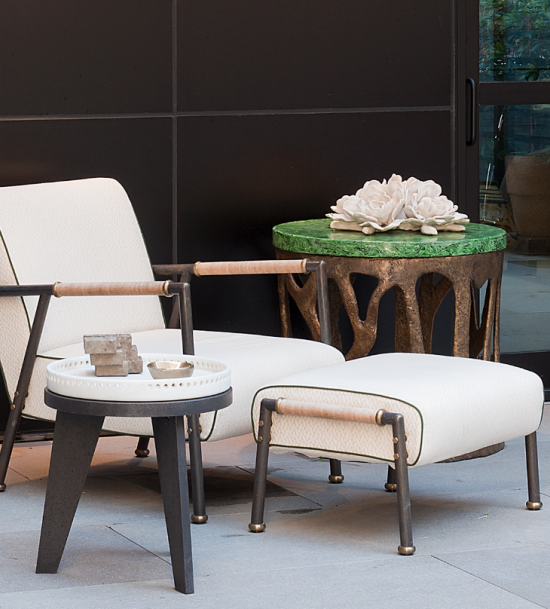 Armchair, ottomon, and large table by the firm Pinto Paris. A small side table, part of Collection Mercury, by French designer Stéphane Parmentier. A standing sculpture by Eric Astoul. A ceramic, sculptural vase by contemporary Japanese artist Kuozo Takeuchi next to a sandcast bronze bowl by Moroccan artist, designer, and photographer Jaimal Odedra; a white, glazed ceramic floral centerpiece by Matthew Solomon. 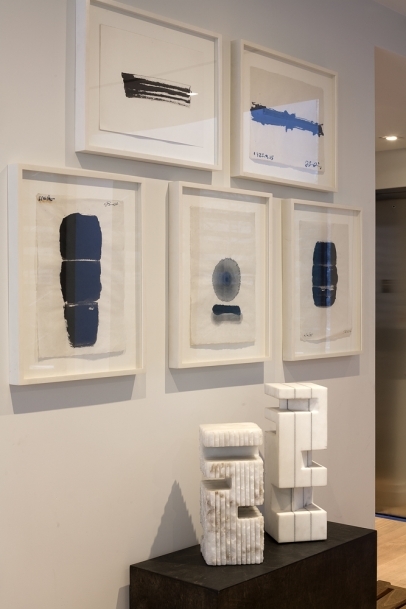 Drawings in ink by Korean Sculptor Yongjin Han; and two marble table top sculptures by Italian artist Cesare Arduini. 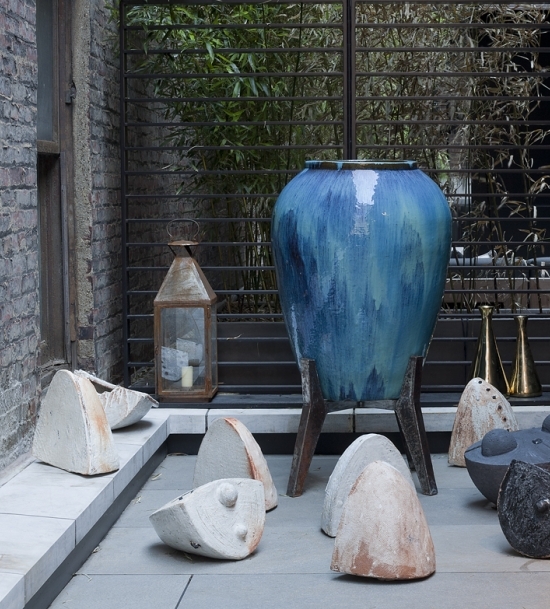 Urn by the Vietnamese artisan collective Atelier Saigon; earthenware sculptures by sculptor Eric Astoul; and a pair of polished, cast bronze vases by Jaimal Odedra. 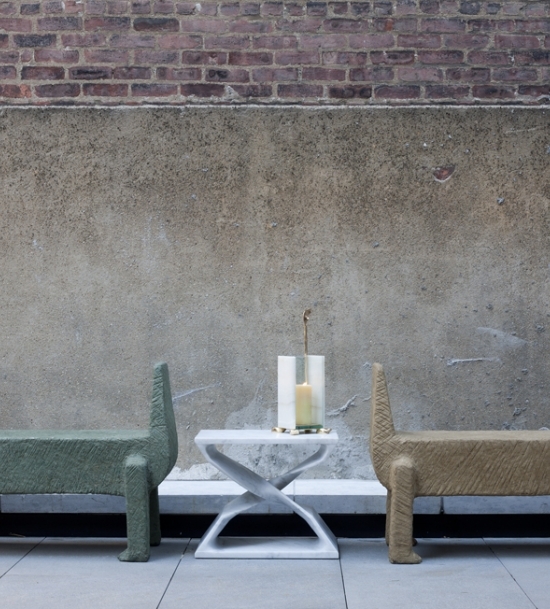 A pair of crocadile benches by Atelier Saigon; a sculptural stool in marble by Carol Egan; and a candlestick by Achille Salvagni's Aldus. 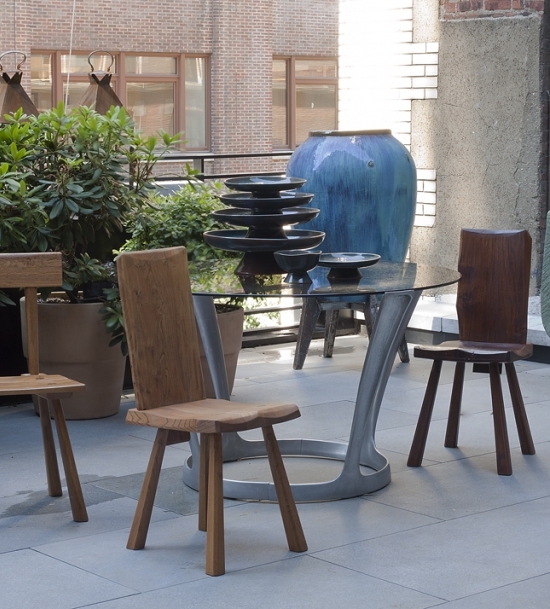 A couple of chairs by the Artisans of Marolles; a stone sculpture by Yongjin Han; and an illuminated earthenware sidetable by Guy Bareff.